Then Rabak, the capital of White Nile state in the south, joined the protest movement and another party office of the ruling party was burned down. In the capital of Northern Kordofan state, el-Obeid, clashes between protesters and security forces escalated which resulted in the storming of the city’s main hospital. Medical workers were beaten and arrested which prompted doctors to announce a general strike in the city. By mid-January, 15 out of Sudan’s 18 states were part of the protest movement. So how is it that Sudan’s countryside woke up and took over the political struggle from Khartoum? Sudan’s economy has been in free fall since South Sudan achieved its independence in 2011 and the country lost 80 percent of its oil revenues. The country had no other industry to rely on and pervasive corruption meant that even though the country was a top recipient of loans from China and Gulf countries, there was no way to stop this economic deterioration. In the eastern state of Kassala, I’ve personally witnessed fuel lines that would often stretch over a few streets and people would spend up to three days waiting in line to get petrol. Fuel became scarce in Medani, the nearest big city to Khartoum, and almost non-existent in Gadarif. Kadugli city in South Kordofan was without electricity for months, as it was entirely dependent on diesel to operate power generators. Bread shortages have also been particularly severe across the Sudanese countryside. 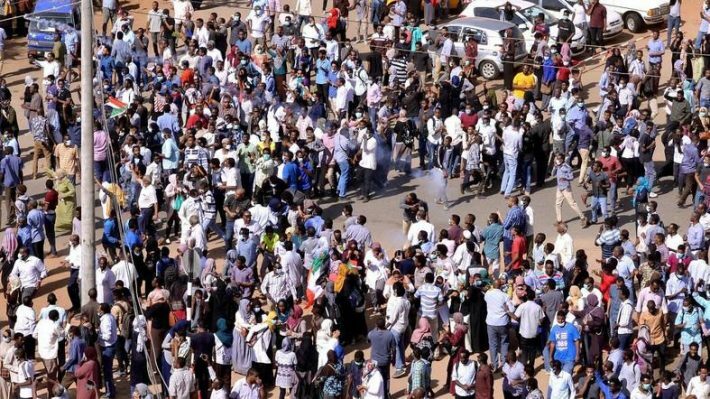 During the first week of the protests, the authorities, in a much-expected move, arrested dozens of students who hail from Darfur and accused them of being saboteurs and part of a rebel group. These spurious accusations did not sway public opinion, as the protest movement fought it successfully and responded by chanting “You arrogant racist, we are all Darfur!”.